The Truth About Noms | Think you know what you eat? It is time to remove the blindfold from the foods you thought you knew and loved. Starting a healthy lifestyle at a young age is super important. I feel like we really need to get kids eating better younger, to enforce healthy habits from the root. Food Babe wrote this super cool article about tricks to getting your kids hooked on green drinks and I couldn’t help but feel the need to share!! Some of her tips were really great. 1. The first tip was involving them from the beginning of the process (the purchase) – this peaks their curiosity and makes them feel involved in the process and excited about it. 2. Talk about how cool it is to drink green juice..I just love this one. Why don’t more parents make eating healthy seem cool? We reward kids with dessert and fast food – but why not start young making healthy eating seem “cool”. She also encourages having other people they look up to talk about how cool it is as well. 3. Let them pick out a fun cup to drink from. This is great! I mean when I go to work out I always get more excited if I just bought a new outfit, so I wouldn’t kids be the same! Getting them a new cup would then get them excited about their drink. love it. 4. Lead by example and don’t sweat it. This is really important as well. Not to make a huge ordeal if they don’t drink it – just keep trying each day or attempt to switching up the recipe. I totally agree – force will not result in good habits. 5. Ease into it with sweeter fruits. By starting with something sweeter it will peak their interest, and once hooked you can switch to better ingredients. Similar to marketing tactics! 6. Finally she included a list of recipe samples which you can check out below. I really love this article and look forward to trying this some day when I have kids!! ::cue the trumpets:: ..it has been one year since I gave up all meat and chicken! Heres to another meat free year! And with that I say…. As a marketer I am always eager to see what new tactics are out there – whether I agree with them or not. In this case not. This interesting article highlights marketing ploys that are not in our health’s best interest. Again I am not here to provide evidence whether this is true or not – but to provide food for thought. Something we can never get enough of these days. My favorite and most close to home is #4- Most diseases like cancer, diabetes, Alzheimer’s and heart disease are hereditary (actually, 85 – 95% come from food/water/bad medicine) This one hits close to home given I have had numerous family members going through these health problems. I couldn’t agree more that food/water/bad medicine really results in our health problems. We are what we eat – and I am passionate about that (hence this blog). Many people may beg to differ – but just consider the above. The full list and article is below – Enjoy! New York to Ban McDonalds? I came across an interesting article about how NYC may potentially put a “ban” on certain items on McDonald’s menu, stating they are more dangerous then illegal substances. Many people may be outraged about this, or have an opinion about how ridiculous this sounds, but in fact this is some of the best news I’ve heard yet today! So many people would assume that putting a ban on a legal food is ridiculous, but in fact – McDonald’s food is technically not real food at all. As I discussed in a prior post, it is made of artificial ingredients created to addict people, fatten them up, and then give them cancer in 25 years. Is that something we want existing on every 4 blocks in our city? 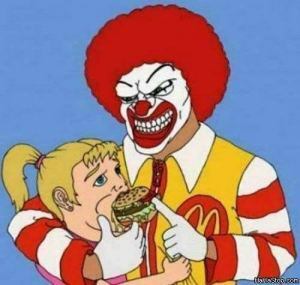 There is no reason that McDonald’s should be treated any different than any other chemical that is poisoning our body. Instead of having a smiley Ronald clown as their mascot, perhaps they should depict the evil clown shown above. That would give people a more realistic idea of the corporation they are buying from. Our society puts labels on things, and if something doesn’t fall into that label or category, we can’t fathom it being there. Well this is a perfect example of something that needs a new label. Besides unhealthy, McDonald’s needs to start being labeled as the toxic chemicals that it actually is. I highly doubt this ban will go into effect, much like the large soda ban that was so close to passing, til the courts last minute ruled it out (go figure, think of all the $ the soda companies paid that judge off with). But if it did, I would think of it as NYC being one step ahead the rest of the world. With its tons of vegetarian, gluten-free, and vegan restaurants – NYC has options that the rest of country just doesn’t. I recently went on a trip to Upstate NY, and couldn’t help but notice the limited food options in the area. Every grocery store stocked with processed foods, greasy restaurants and fast food every mile on the highway. It was nearly impossible to locate any food that seemed at all remotely healthy (besides from making your own food at home). No wonder our country is being faced with these issues…the options are NOT out there. And for that, I commend NYC – for giving people a chance to eat better, something that is not so easy in other places. With its admittance that McDonalds is literally a toxic cancer forming agent, we are again taking one step in the direction of knowing. 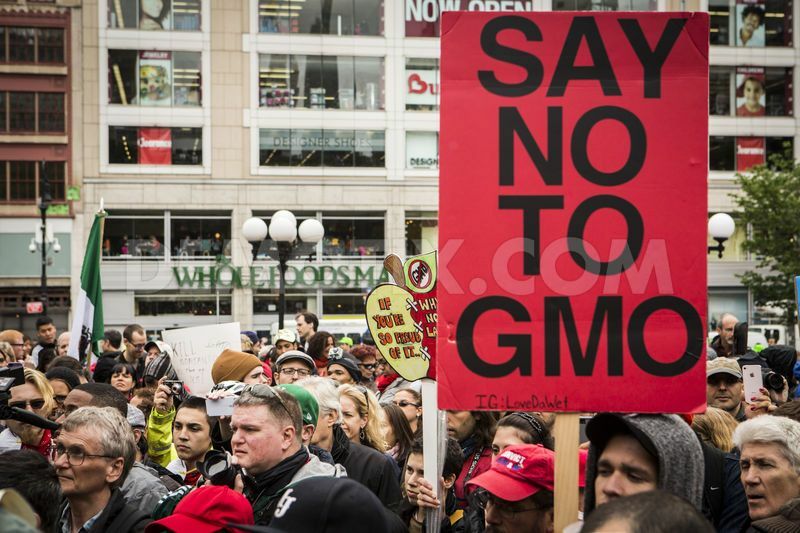 One giant leap in the fight against GMOs! For those of you who think fighting against major corporations is a failed cause, think again! The Monsanto Protection Act, an act that protected sellers of genetically modified seeds from lawsuits, even if the resulting crops cause harm, is set to EXPIRE on 9/30 and WILL NOT BE REINSTATED. This is a huge victory for Anti-GMO and Anti-Monsanto activists and believers. 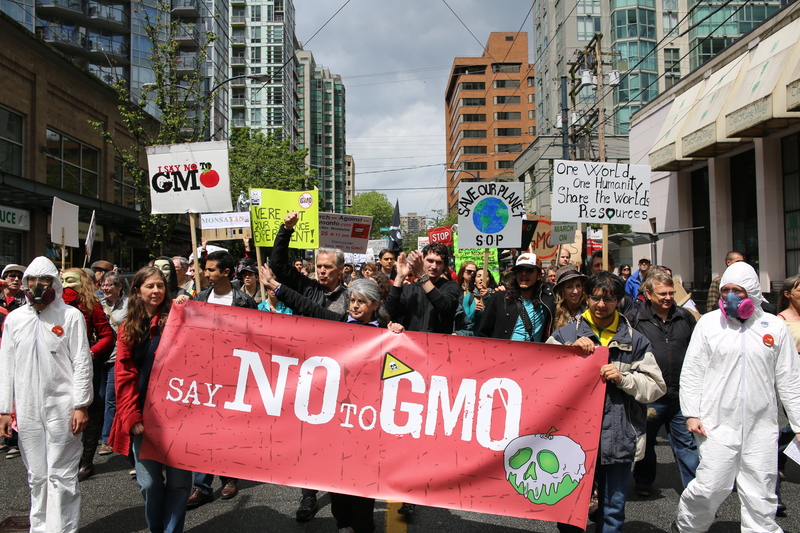 Thanks to the thousands of Americans who protested, had their voices heard, and spoke out against GMOs, we are making steps in the right direction! Although this does not rule out the use of GMOs, there is now no longer a law protecting GMOs against harm. On a bigger scale, it is recognition that the people have a problem with GMO’s and that our voices have a chance at being heard. Keep it up folks! Read more about the removal of the act here.